You can learn lots of different embroidery stitches, but you can also work with a small selection and still create many looks. Layer and combine a few basics (or more advanced stitches!) and you're ready to make all kinds of borders, frames or other decorative elements. You can work these six combinations in multiple colors as shown, or try working them all in one color. Suddenly the blended stitches will begin to look more like one complex stitch. 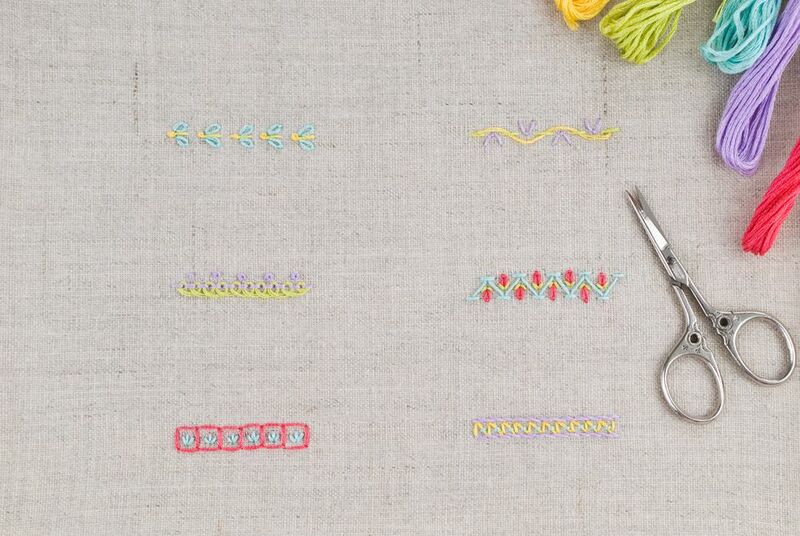 After you try these, check out five more embroidery stitch combinations. You can use this stitch combination to create a single bug or a whole border of them. Start with a pistil stitch (a french knot with a tail), then add a detached single chain stitch on each side. If you are stitching a row of these, work them on a line and try to make each one the same size. Of course, you don't have to have them all facing the same direction. Alternate rotating them slightly to the right and left to create movement. You can also scatter them to make a small swarm. This larger border stitch has a lacy look to it. Make a line of loose Pekinese stitch. Add a french knot above every other stitch in the line of stitching, or over every stitch for a more dense look. Embroider this in a circle with all white and fewer strands to create a "crocheted" lace doily frame design. Work this combination in straight lines or to create a boxed border. Stitch a line or border of four-sided stitch, which you can also make with back stitch. Fill in each square with three small straight stitches that meet at a point. For a fun look, try stitching the straight stitches in multiple colors. Or choose another small stitch to work inside the boxes. This stitch combination ends up looking a bit like a climbing floral vine, especially when worked with a green base. Embroider a line of woven running stitch. Add fly stitch "flowers" in each gap in the running stitch. Try working this in a circle to make a frame, then adding a favorite phrase or quote in the center. Create rows of tiny tulips with this grouping. Fitting the flowers into the chevron is optional because the tulips are fun on their own too. This combination of stitches works best on a straight line. You can substitute the stitch along the top and bottom with your favorite line stitch. Stitch two parallel lines of stem stitch. Fill in the space between the two lines with zigzags of back stitch. Work running stitch over the angled lines. There's no limit to the ways you can combine your favorite embroidery stitches. Keep mixing them to create new looks!